The Rock & Rave Experience!!! Feat Skazi Live In Concert!!! Supported By King Lizard Live!!! @ The Fridge In London! Town Hall Parade, Brixton, SW2 1RJ, London, UK. Blast Off : 09.00Pm - Re-Entry : 07.00am! Plus After Hour In Brixton! 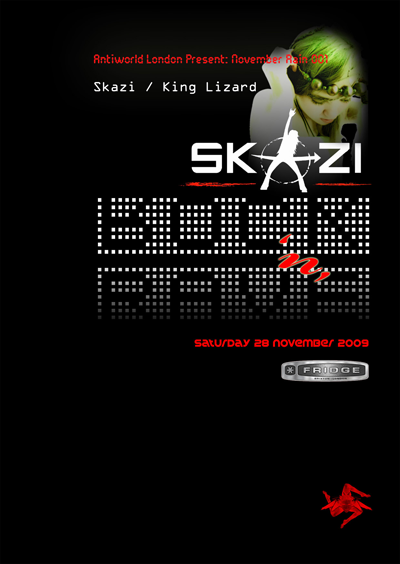 Skazi (Live & DJ Set)!!! 29.11.09: The Official After Hour In Brixton:! priced at only £ 10 Plus BF. Break The System Down 003! @ The Fridge In Brixton / London!